We are a fan of Blue Buffalo cat food around here and the fact that every year they raise money for companion animal cancer research is great. So when shopping recently we were told about a new litter by Blue Buffalo from the store staff (they know how picky we are with cat litter and products). So we bought a bag and tried it out. The litter is made from walnut shells and is 100% natural - I like that and the fact there is really no odor after Mar uses the box. That is about all I like about the litter. Mar does not like it - I can tell by how long he is in the box trying to cover things up. Also he has gotten litter clumps all around the box kicking around so hard. It states that it is low tracking - I found that it clung to Mar's paws a lot and tracked a lot more than other litters. It does clump well, a little to well. I had a hard time getting some clumps up. Safe to say we are going back to our old litter. I like the promise of more natural products for cats on the market - I will continue trying new things and buying those that work! I have the same problem with BB litter plus there is brown dust all over the bathroom now. I am stopping it today. Hate the stuff!! !So what litter are you going to go back to? I was using World's Best Cat Litter, and loved it. But then I couldn't get it in the large bags any longer at PetSmart, and with it being corn-based, the price kept going up. 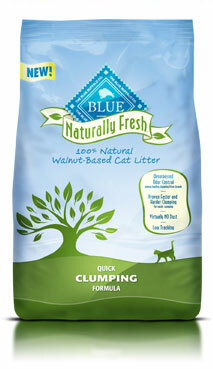 I tried the Blue Buffalo walnut-based litter, and am still using it. The cats seem to like it, and use it well (and I have MANY cats), but there is brown dust everywhere! I find that it does NOT clump well for urine. In fact, I can't even scoop the urine out, it just dissolves into the litter. So after a while, the litter smells strongly of urine. I love that it is natural. But I don't think it lives up to its promises. I think I am going to return to World's Best Cat Litter, even if I have to pay more. I used World's Best Cat Litter for close to a year. I thought it was the greatest litter, tracking control was okay and fairly good oder control. Then summer came along with the very hot and humid weather. WBCL took on a life of its own, though I cleaned the solid waste and clumps daily, it had a strange offensive smell. I have been using Feline Pine (non-clumping) for the past few years, and so far find it works great. If you don't use the tracking type you need to use their 2 part litter box with the grate. Removed solid waste, shake the pine dust and it falls into teh botom pan and absorbs the liquid. Down side is with 2 cats I have to empty the bottom pan a couple of times a week.